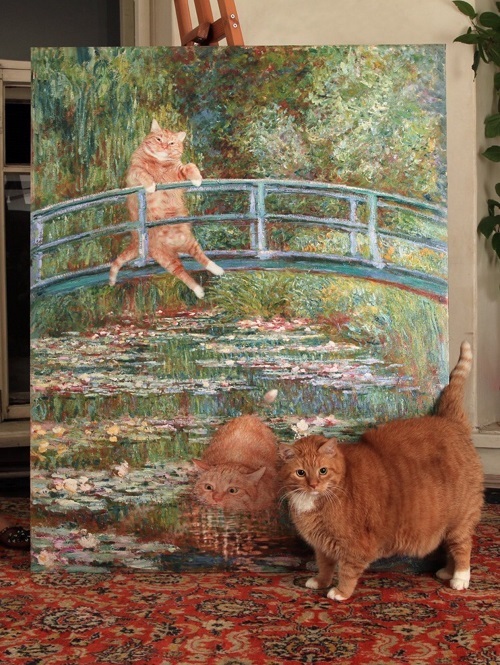 A fat orange cat proudly stands in front of a painting of 2 fat orange cats hanging out at a picturesque stream. Image source. 1. On the Plausibility and Purpose of Paul’s Sea Voyage in Acts 27 (posted December 11) "If we consider it theologically, however, there are intriguing connections between shipwrecks and criminal guilt in Greek legal and religious thought — connections lost on a modern audience." 2. Perfect Number Watches VeggieTales "Madame Blueberry" (posted January 27) "This VeggieTales story claimed that it's teaching 'being thankful is good' but instead it seems to be teaching 'wanting things is bad.'" 3. We can draw school zones to make classrooms less segregated. This is how well your district does. (posted January 8) "But they also found causal evidence that this integration causes "white flight" out of public schools." I remember learning the term "white flight" from high school history class. Like it was this big bad thing that unbelievably racist people did a very long time ago. Well, turns out it's still a thing NOW, and it's something that "nice" white people are doing, while they claim they're just trying to put their kids in better schools. 4. The Elephants in the Room: Rapid Migration and Recolonization of the Earth Following a Global Flood (posted January 16) "Why should the remains of giant sloths—and all other sloths for that matter—be found only in the New World if they migrated from Noah’s Ark in the Middle East? How did they manage to leave no fossils in the Old World while leaving thousands of fossils in the New World? What was their migratory path to the New World and how could these slow-moving, large animals have made their way into the Colorado Mountains in such a short period of time? Why, if they were so widely distributed and abundant just 4000 years ago or less in the YEC chronology, did they then all disappear?" These 2 posts are a MUST-READ for anybody who is or used to be an apologetics nerd. The first is about how the geography of the Christmas story in Matthew is totally different from the one in Luke. The second is about how playing the game of coming up with not-quite-impossible explanations to "harmonize" the 2 passages totally misses the point. 6. The Fall of the Veils (posted 2014) A Harry Potter fanfic featuring a relationship between Harry and Draco. And Draco is asexual. 8. World Magazine on Andy Savage: “Each Christian must acknowledge, ‘I am the abused and the abuser. '” (posted January 29) [content note: minimizing sexual assault with "we are all sinners" ideology] "But evangelicals do not typically define sin as harm-based. They define sin as going against the commands of God—whether or not harm is caused to another person is irrelevant—and talk of sin as being against God." Yes, what Libby Anne's describing here is EXACTLY what I was taught about sin. 9. Concordance-ism is not your friend (posted January 24) "But it didn’t challenge the overall construct of concordance-ism itself — the idea that we choose what terms to “look up” and thereby exclude every other passage and every other perspective and every other thought, reassuring ourselves that we already knew everything there was to know about something before we even got started manipulating the index to “prove” our prior assumptions."